I wrote this essay for the St. Gallen Symposium’s essay competition whose topic in 2016 was “Alternatives to Economic Growth”. I’m sharing it here after slight editing. I thank several people who commented on drafts. It impressed me, because I had never thought about these developments from this angle. So what happened in the last centuries that led to this change? But since the late 18th century there has been real sustained growth. In the course of this revolution, factories were build, the face of the earth was altered and trade networks spanned the globe, e.g. for cotton.5 Economies’ productive capacities per person increased in real terms between 1800 and 2010 by a factor of 11 in the United Kingdom, 21 for Germany, 9 in the Netherlands and 24 in the United States.6 Consider what that means: Could you imagine your living standard to be a tenth or twentieth of what it currently is? But while we should applaud the fact that differences between countries have decreased globally, inequality within countries has been rising. Thomas Piketty, in his best-selling 2014 book, warns of rising levels of income inequality and wealth inequality which in the Anglo-Saxon countries approaches levels not seen since the First World War.10 This point is made similarly by Angus Deaton, the winner of the 2015 Nobel Memorial Prize in Economic Sciences, who analyzes global trends in health and poverty and makes a case for optimism about the state of the world. However, he cautions that in some cases of “Great Escapes’’ from poverty, the new elites have held down the people rising after them.11 He evokes the picture of a ladder being pulled up. So maybe we are seeing a return to the previous state before modern economic growth with large differences within countries and less strong differences between countries. And while the impact of globalization on inequality is almost mechanic, an old fear is emerging again: automation. 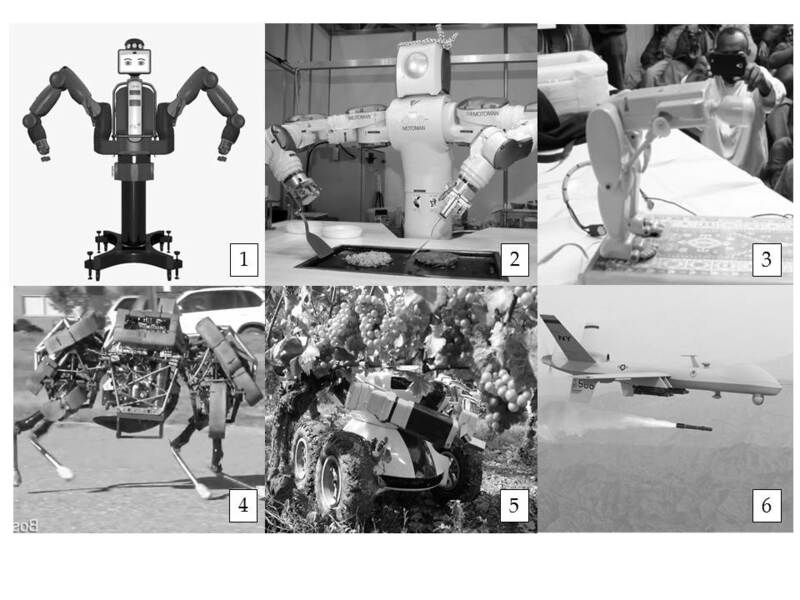 Meet Baxter (panel 1 in Figure 1): He is a friendly general-purpose robot who can be taught simple manual tasks by moving around his mechanical arm. He is safe to have around and reliable. This makes him great for jobs such as lifting objects or sorting things. Other robots bake pancakes (panel 2), teach the prayer (panel 3), carry heavy loads across dangerous terrain (panel 4), pick grapes (panel 5) or shoot rockets (panel 6). Foxconn, the main manufacturer of Apple’s iPhone, already employs 50,000 robots in its Chinese factories and is planning to automate large parts of its production. Google is testing self-driving cars and they might become a reality on our streets. And who needs a taxi driver then? 200 years ago, the Luddites in England worried about automation in the form of mechanical looms. Since then, people have warned periodically of the rate of progress outpacing people’s ability to adapt to technological change. Some even quipped that humans will be made as redundant as horses in the advent of the automobile. However, these warnings were usually exaggerated as previous waves of technological progress replaced old jobs with new ones, leaving most people better off in the long-run. The most common recommendation of how to deal with these disruptions is to encourage more education for people to adapt faster and to gain skills that are complements, not substitutes, to machines. But maybe that is not enough, because this time might be different in an important aspect: Technology is also advancing in fields that have previously been thought of as safe from automation. Research on artificial intelligence and machine learning is making fast progress. IBM’s algorithm Deep Blue beat the world’s best chess player, Garry Kasparov, in 1997 and Google’s AlphaGo beat the best human player at the ancient game of Go, which was considered to be much more difficult for computers to excel at, in 2016. Other algorithms have been developed to recognize songs, judge people’s attractiveness and compose music. These fears of automation are also expressed by Erik Brynjolfsson and Andrew McAfee in a recent book in which they warn of a “Second Machine Age”. And what should worry us most is the increasing concentration of capital – be it robots or factories – in the hands of few which could lead to rising within-country inequality. Researchers have shown that across the world, the share of income going to labor has been in decline since the 1980s.13 Part of this decline can be explained through a rise in automation and computer technology. When automation advances, capital owners benefit more than workers. In the limit case, few capital owners could own all robots, while the rest of humanity would depend on their charity. These distributional pressures raise several concerns. The first problem with inequality of wealth and income is that it is in several ways self-perpetuating. Wealthy people likely achieve higher returns on their wealth through better investment advice and opportunities. And some rich people might also use illegal opportunities for higher returns by evading taxes. Gabriel Zucman documents how France missed taxes in 2011 of about one percent of its GDP due to tax evasion.14 Changing marriage patterns work similarly. When once a doctor might have married his assistant and a CEO his secretary, couples are now more alike in their education and incomes. Inequality has real costs for the economy as a whole. Daron Acemoğlu and James Robinson argue that in the long run countries with inclusive institutions prosper and countries with extractive institutions suffer. A concern is that the middle class in countries like the United States might not feel included anymore or – to cite Charles Murray – society is “coming apart”. This point is also supported through research by Anne Coase and Angus Deaton, who show a worsening in the mortality of middle aged white men in the United States. And inequality is not just a problem for society as a whole, but it impacts individual people. Researchers have shown that people are not only interested in their own well-being, but have an inherent wish for a fair distribution.15 Our bodies react with unhealthy heart rates to perceived unfair distributions and even monkeys were shown to react badly to unequal rewards.16 17 What we learn is that questions of efficiency cannot be analyzed separately from questions of fairness and distribution.18 So instead, let us counteract these forces and work towards a society where people participate more broadly. I propose to rearrange our priorities from generating aggregate economic growth, to encouraging inclusive growth. Does that mean that we should not value economic growth anymore and need a complete alternative to it? No. If everybody is poor, then there is no inequality. But it is important to acknowledge that the two are not independent of each other. And we do not have to choose one of these modes for the exclusion of the other, because making sure all parts of society are included also allows for more material wellbeing for everybody. So how do we get there? A number of solutions have been proposed. And while there is no perfect and exact solution, some argue for higher minimum wages and some for unconditional basic incomes. Brynjolfsson and McAfee push for negative income taxes, which seems promising because it subsidizes human labor and recognizes that work gives people purpose. But the actual first step is to acknowledge that there is a problem. We can make our world a more inclusive place and we can start building this society now. Let’s not wait.